There was an iPad going for 249, which looked good. Picked it up from store. But check if it is still there online. Why do I need it- looks like we are going to present it my Sasu ma next time we visit India. BTW, we got instant pot last year, but not used it yet. Btw, do you have thanksgiving in canada? And Black Friday too? I bought a few necessities I buy every year.. like free ream of printing paper, free anti-virus, toys for my 5 yo. Jeez! of course we have Thanksgiving in Canada! Instant pot is supposedly a boon for women who have jobs and have to cook. You can load ingredients in it and program it to cook just before you are home. One neighbor claims she has even jamaoed Dahl in it. Better half brought it last year at Black Friday because everyone told her it was great. But she has not used it yet. Shopping doesn’t know borders. Apparently this US custom has moved to South Africa and Inglistan. KKKK, is that Boxing Day sale still on? ^^^ I should have guessed about UK.. I was looking to get a new pair of glasses when I got directed to a site offering discounts for Black Friday.. I was thinking it's for the US customers. yeah boxing day is still on. plus we have black friday sale now and cyber monday as well as prime day... all amazon imports leading to competition between retailers. too much excitement I reckon, less substance. more often than not, the items in sale are the ones that I specifically dont want/need. I have been considering a noise cancelling headphone this year - Bose Quietcomfort 35, its on sale but not by much. So that may now lead to Aashi ji being really the only one on the EC planet not having instant pot. Kohl's is another one that can go out of business in few years..
Last edited by sarv_shaktimaan; May 9th, 2018 at 10:34 PM. 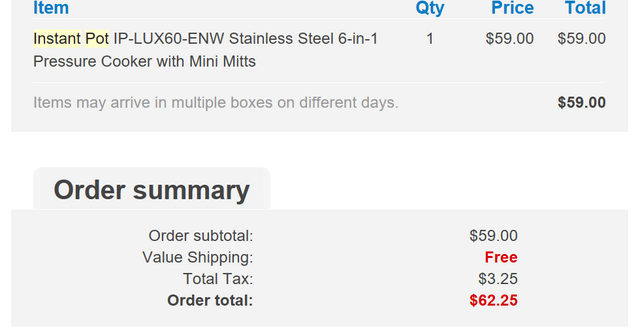 I ordered last night for 99, now it's 143, edealinfo.com was showing this as hot deal. Saved me fitty bugs. Last edited by sarv_shaktimaan; May 10th, 2018 at 03:25 PM. Here is my order for 2016 black friday. Not sure how the features stack up.